As any of you who follow my blog know, Christmas is always very trying for me. It was made even more so this year by the arrival of the Noro virus first in Beau's gut and then in mine. We both lost weight over the feasting season. Directly upon my feeble recovery, I wrote a very heavy blog post about the severe sexual abuse that is the reason Christmas is so tough for me. It went a bit viral and gained me a whole bunch of new followers, including war veterans, conservative Christians, social workers, and writers... all with one thing in common: PTSD. It was great to be able to make a connection with others who suffer with PTSD, but it was also very emotional and draining for me. So Christmas was pretty heavy for me this year. And what do I do when I'm feeling a bit, well, overwhelmed and shell shocked? 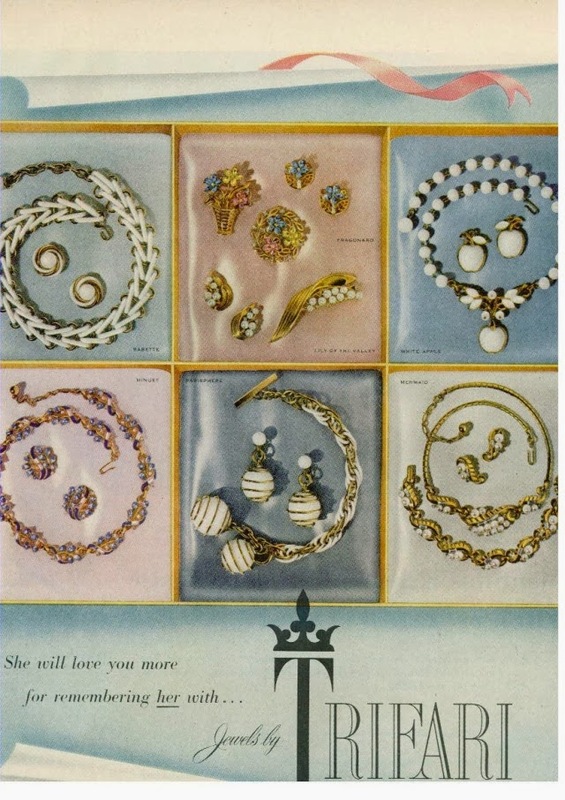 I go vintage jewelry shopping. Natch! And I got quite the haul, bits and pieces of which you will see over the coming weeks and months. But I'm starting with this Trifari brooch. Now, you may or may not know it but I have an absolute pash for vintage brooches. 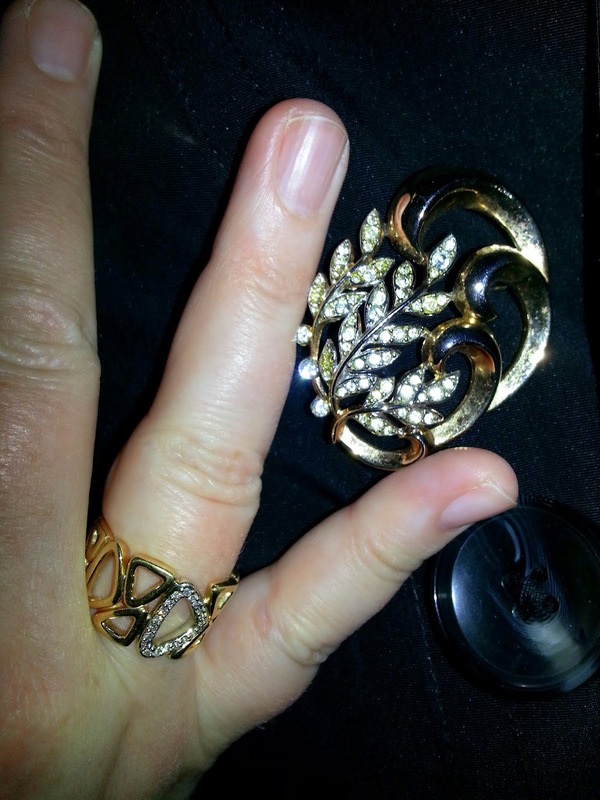 I love all vintage jewelry, but grandma brooches, as I call them, make my heart sing. I already have a pretty great collection of them, but no-one can ever have too many brooches or too many books, so doing more shopping was guilt free. I flatter myself that I have a pretty good eye for them too, but a girl can always learn more. 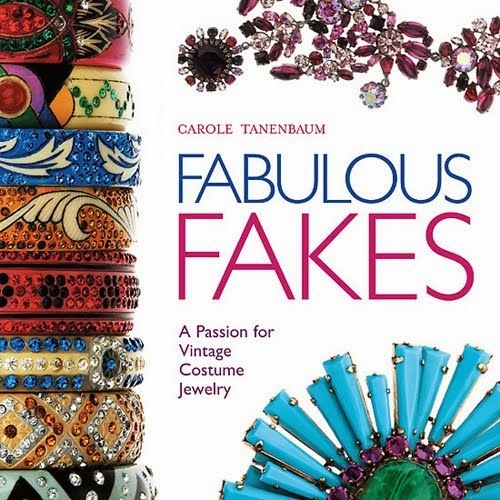 For Christmas, Beau bought me Carole Tenenbaum's great book about costume jewelry, Fabulous Fakes, and reading it helped me to develop a better knowledge of what brands and markings to look for when finding a really good piece at a really good price. I put the new knowledge to use right away. At Value Village, they put what they consider to be valuable pieces under glass. They put what they think is trinkety junk on pegs on the wall. The brooch on the left was on a peg. I knew immediately that it was from the 50s or 60s and was of much better quality than the stuff around it. I snatched it before anyone else found it. When I looked at the back of it with my loupe (yes, I own one ... well three actually), I was rewarded. 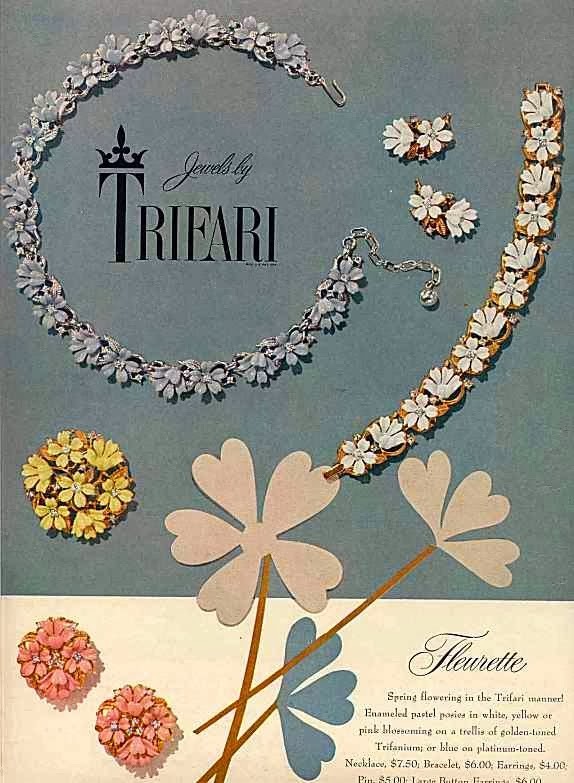 It was a Trifari. And it was five dollars. 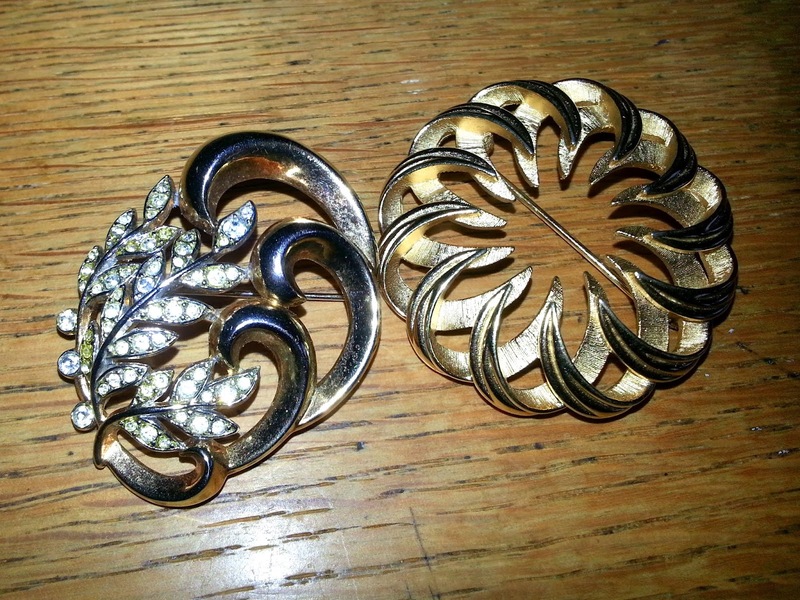 A few days later, I went to my secret, favourite, thrift store way out in the hideous suburbs, where, among other things, I found the brooch on the right. I liked it and it was only $1.50 so I just threw it in my "buy" pile and thought no more of it. You see, the place is run by very old ladies and closes at 3:30 every day. It was now about 3:15. But, when I got it home and looked at it with my loupe, it too was Trifari! Score! 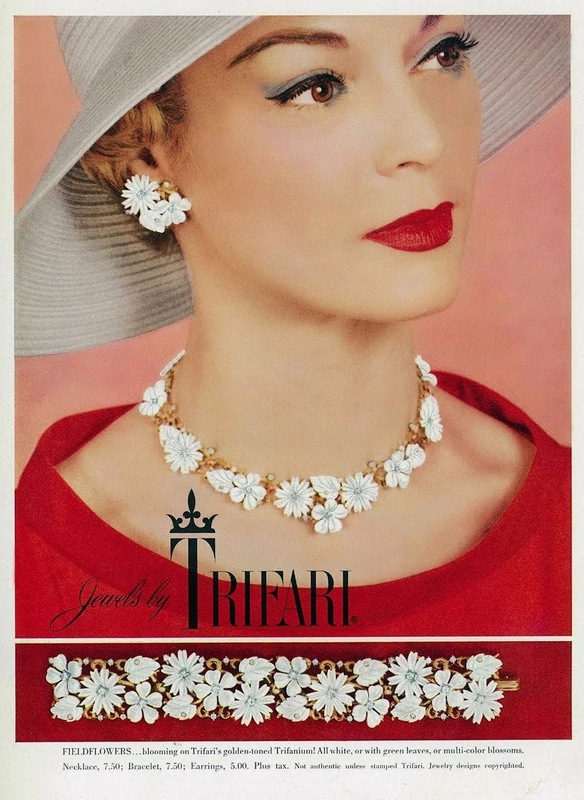 Aren't their colour palates in these old advertisements fabulous? They're so... so... pastel! 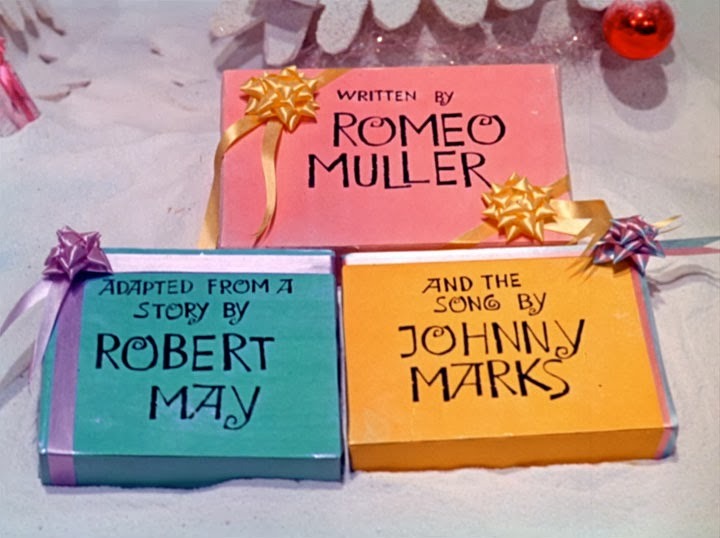 Just like the colour palate in the opening credits of Rudolph the Red Nosed Reindeer. Seeing these connections in design history just makes me giddy all over. I can't even say exactly why. Some day maybe I'll do a post just on fonts that make me tingle. But I digress. 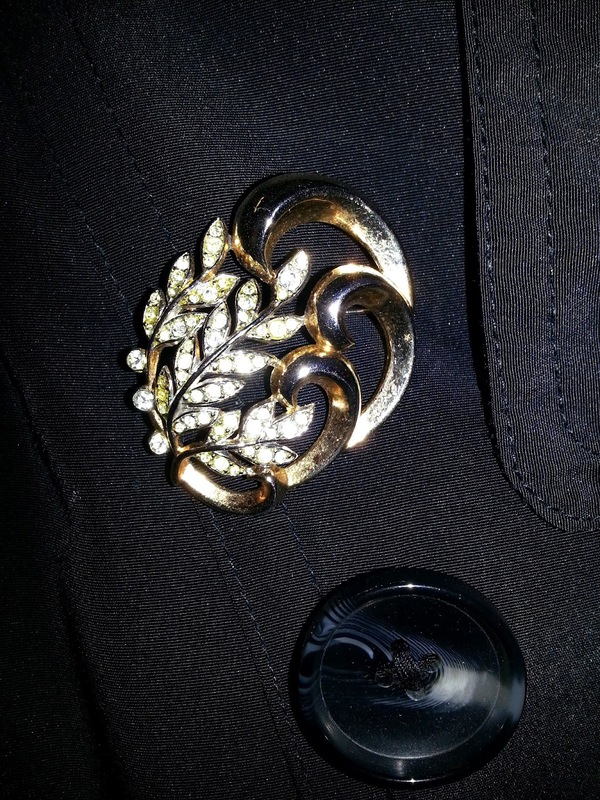 This is about my Trifari brooch, which had its inaugural outing today. My back hurt like hell, I was pissed at my abusers for rendering me crippled, it was pouring rain, and I was worried about money because my disablity won't let me work full time. 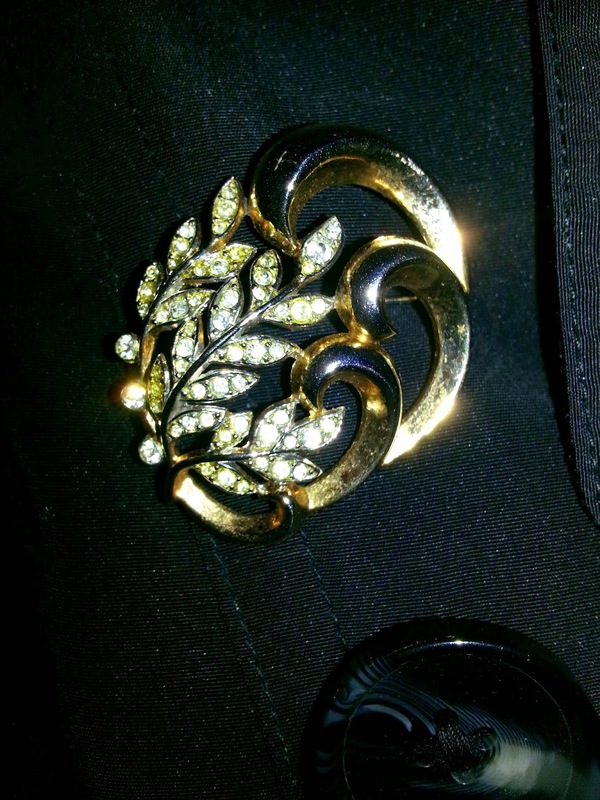 But, my Trifari brooch did not disappoint. I loved wearing it. I didn't feel all classy and poreless like this red-lipped wonder here. But I did feel just a little more poised than I would have without the brooch. And poise is something not easily achieved with a half broken back. So, hey, a Trifari brooch it was, on a rainy Sunday in pain and in rain. Keep your eyes open for Coro and Sarah Coventry and Monet, and any number of other broochly wonders in future posts. Well I'm all for that, Alicia. Send them my way. You know I'll wear them. A little shoppy therapy is never out of place, regardless of the opinions of pious non-shoppers. Glad the joy of a perfect, little, bright thing helps. I know what you mean, at least about that. 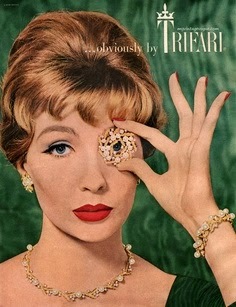 I'm obsessing over vintage "bee" brooches right now. I often need a little of the kind of cheer I imagine you feel. My discomfort is from different stresses, but I empathize! Your brooch is really nice!! It's interesting how a little piece can make us feel happier, don't you think? And thank you so much for linking on Très Chic Style Bits.